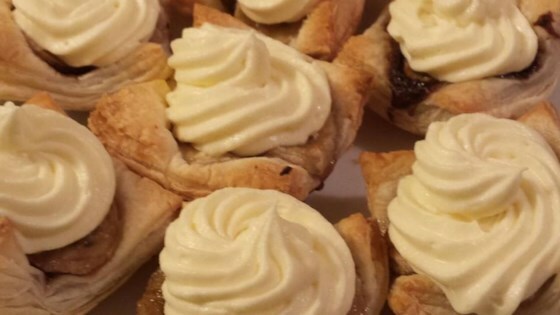 "A quick and easy dessert made with puff pastry filled with Nutella® and bananas. Top it with a creamy cream cheese topping and you have a taste to die for." Preheat oven to 375 degrees F (190 degrees C). Grease two 24-count mini-muffin tins with cooking spray. Cut each puff pastry sheet into quarters. Cut each quarter into 4 square pieces. Fill each mini-muffin cup with 1 puff pastry square. Spread 1 teaspoon chocolate-hazelnut spread over each pastry square. Place 3 banana slices on top. Bake in the preheated oven until golden brown, 15 to 18 minutes.. Transfer to a wire rack to cool completely. Beat cream cheese in a bowl with an electric mixer until smooth, about 2 minutes. Add heavy cream, sugar, and vanilla extract; beat until frosting is thick and creamy. Pipe or spoon cream cheese frosting on over banana slices.